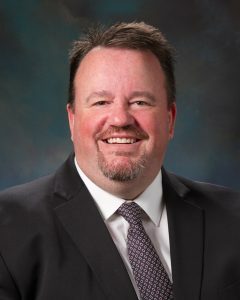 The City of Pittsburg has hired Chris Patterson to fill the position of general manager at the Memorial Auditorium & Convention Center. Patterson was selected following a national search and began his new position October 11. Patterson comes to Pittsburg from Detroit, Michigan, where he served as an independent promoter for national touring artists. He plans to use his expertise in the music industry to bring more live music offerings to the Memorial Auditorium stage. With a 25-year career in the concert business, Patterson got his start in Oxford, Ohio, as a member of Miami University Concert Board. He worked with industry legend Barbara “Mother” Hubbard to produce a variety of shows on campus, including Bob Hope, George Burns, Jay Leno, Sting and R.E.M. Since that time, he has served in a variety of industry roles, ranging from tour manager/accountant, director of booking and production, to independent promoter. As tour manager/accountant, Patterson spent over 12 years working with artists from Amy Grant to ZZ Top, while touring non-stop across North America, Europe and Asia. Some of his other clients included Donny and Marie, Deep Purple, Lynyrd Skynyrd, Luther Vandross, John Mellencamp and Sinead O’Conner. At Olympia Entertainment in Detroit, Patterson served as director of booking and production, overseeing the annual presentation of more than 200 concerts, theatrical productions and family shows. Venues included the Fox Theatre, Joe Louis Arena, Cobo Center, and Comerica Park. As an independent promoter, Patterson booked and produced a number of shows in theaters and arenas, including 38 Special, Kid Rock, Journey and Kenny Rogers. Most recently, he teamed with the Anschutz Entertainment Group (AEG) to bring Katy Perry to the 55,000-seat Philippine Arena in Manila.